Our Donaldson steam filters and housings are available in a wide array of configurations, with flow rates from 35 to 13,000 scfm. They can frequently be found in culinary (food & beverage), pharmaceutical, and chemical applications, as well as other critical industries. Please contact us for pricing and availability using the form below. Filter Products Company is an authorized Donaldson Process Filtration partner, and our friendly staff is standing by to assist you. P-GSL N stainless steel pleated filter cartridges are developed for low-pressure steam systems where high filter loading capacity and differential pressures of up to 75-psid are required. We offer absolute retention ratings of 1-micron to 250-micron. 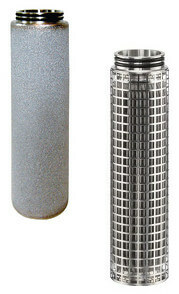 P-GS sintered filter elements are made exclusively of 316L stainless steel and come in 1-, 5-, and 25-micron absolute filtration ratings for steam purification. 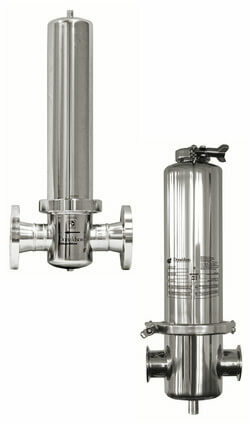 P-EG 304 stainless steel housings come in 18 sizes to fit the needs of your process. Some sizes can be configured in 316L stainless steel for maximum corrosion resistance. ANSI flange and NPT connections are available on most sizes and an ASME code stamp is available on select configurations. PG-EG housings are available for purifying steam and technical gases in sanitary and hygiene-critical applications. There are 12 standard sizes, and many models in the PG-EG line are made to 3-A Sanitary specifications. Configurations in the PG-EG line include 304 and 316L stainless construction, and Tri-Clamp or ANSI flange connections. Contact Filter Products Company for excellent Donaldson products at excellent prices.